← Heads up, local history buffs… lets make Brownhills history! Graham Evans of Chasewater Wildlife Group has pointed out to me that Lichfield District Council last year published a voluntary code of conduct for dog walkers at the park. In the light of recent events, he thought (as do I) that it’s a good idea to link to it here. It was initially issued in response to the apparent killing of a swan by out of control dogs last year, and although I think it’s probably pitched a bit too high for those generally causing the problems (You need to be able to read, for starters…) it’s always worth pointing up. Coupled with this, there has recently been issued a map of alternate walking and cycling routes through the park during the dam works. Click here to download a handy, print and keep .PDF version of the plan. 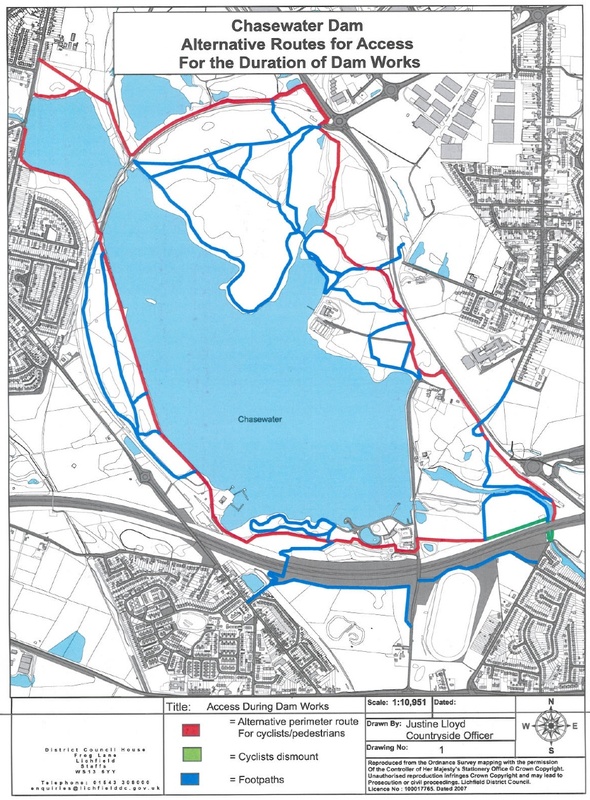 Alternate access routes during the Chasewater dam works. Green lines: If you are cycling on the red route, can you please dismount on the green bits – this will help us to protect fragile heathland habitat on the Anglesey Basin SSSI. Also published on the fascinating Chasewater Dam Blog, the official blog of the improvement project, the indefatigable Lizzie Thatcher has posted plans of the work to be undertaken, which, to map nerds like me, are fascinating. It’s worth keeping an eye on the Dam Blog, as there’s plenty of discussion going on and Lizzie is doing a cracking job of keeping everyone informed, often in the face of no little unpleasantness. This entry was posted in Brownhills stuff, Chasewater, cycling, Environment, Events, Followups, It makes me mad!, Local media, planning, Reader enquiries, Shared media, Spotted whilst browsing the web, Wildlife and tagged Brownhills, Chasewater, Chasewater Dam, Chasewater Dam Blog, Chasewater Dam Repairs, Chasewater drain, Chasewater horse incident, Chasewater mud, Chasewater Safety Works, Chasewater Wildlife Group, local blogs, planning, Reservoir, Wildlife. Bookmark the permalink. Have just sent you a pm to clarify my position regarding Chasewater – it seems we have the same passion for the area as each other – it breaks my heart to see what has happened to our area. I am also saddened to hear that you seem to have been targeted by a small minority – it is very upsetting to read this. I went through an early process with local councillor early on and with Neil Turner – head of leisure – a complete waste of time and a catalogue of contradiction I’m afraid. Plan 2 (as you know) is then to use adverse publicity as a means of getting at least something done.